Woman, 112, 'oldest to have hip op' Jump to media player Britain's oldest person may have entered the record books again - by having a hip operation at 112 years old. Welsh NHS pays for hip op in Belgium Jump to media player Welsh patients may be waiting months for NHS operations unaware they could get the health service to pay for quicker treatment in Europe. Britain's oldest person may have entered the record books again - by having a hip operation at 112 years old. 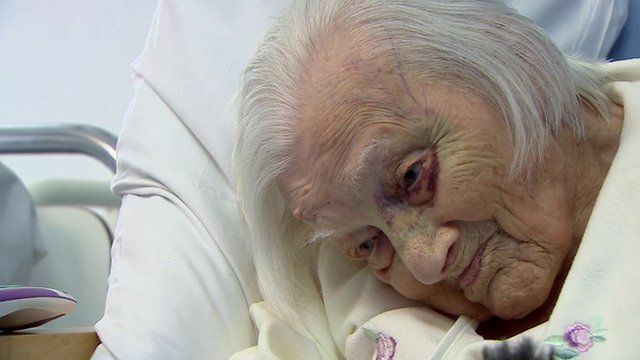 Surgeons say Gladys Hooper is probably the oldest person in the world to have had a hip replacement. She is now recovering in hospital on the Isle of Wight. Duncan Kennedy has this exclusive report.